"They don't build 'em like they used to. Ain't it a shame!" No matter how well planned or how creatively designed, today's buildings just seem to lack the character and quality of the buildings of yesteryear. Historic buildings often reflect the lifestyle of the past and say something about the people who occupied them. From the exquisitely carved pediments to the hand-hewn beams, America's heritage, a record of its ethics and character, is preserved in its older buildings. Few people think of buildings as works of art, but they are. The vision of true genius can be found in some of the innovative designs of our architecture. Craftsmanship rarely seen today abounds in the details so generously included in older buildings and houses. The building fabric tells much about a way of life that existed once, and is now nearly extinct. Old buildings are an important part of America's heritage and need to be protected from the ravages of man and nature-- and of time itself. The honor of protecting these majestic and not so majestic structures and the history they tell, falls only to a few of us fortunate security practitioners. What an honor it is! To provide protection to a modern plastic and aluminum building is difficult enough. The stakes are high. A fire or theft can wipe out corporate assets and slow the wheels of commerce. Even life can be lost if we fail in our mission to protect the assets and properties in our charge. But the loss of an historic building or structure is an even bigger tragedy, making the burden greater for those of us who specialize in this task. Harry Jackson, a well known Western artist and sculpture from Cody, Wyoming, once said, "You are born and you die. In between, you wander. A museum is a place where the marks of your wanderings are preserved. There is no way any one person can approve of everything that hangs in a museum. It would be like liking everyone in the world. It is nice that someone dedicates his life to protecting art-- because it is art--whether he approves of it or not." The same can certainly be said of buildings. Some are better, more artistic, and have more character and history than others. But if they are worth preserving, they are worth preserving right. They deserve our dedicated efforts to protect them because in protecting the structure, we also preserve a memory of our own heritage, our traditions, our roots. Protection and preservation go hand in hand. In today's disposable world where we throw away functional items to make way for newer ones, we tend to destroy far too many of our historic structures. Renovation is expensive and preservation is often out of the question. When we do engage in preservation, it is usually with commitment and quality that would make the original builders of the historic structure turn over in their graves. The same lack of dedication to quality today is the reason we are less often building masterpiece buildings. America's heritage deserves better. We need to maintain a standard against which we can compare our own progress as a civilization, lest we strive to live up to the standard of plastic and aluminum which are so often found polluting our cities and towns today. There are two types of historic "restorations"-- good ones and bad ones. Again, if it is worth doing, it is worth doing right. As a minimum, when resources are lacking to allow a restoration that is optimum, the security practitioner should not do anything that will damage the historic structure-- even if that means doing nothing at all in some cases. Very often, the specialist in protecting historic buildings must be far more skilled than the practitioner who simply screws a detector to the wall, drills a hole for a new lock, or pulls a wire through an existing conduit. What is "historic fabric?" Historic fabric refers to the materials that the historic building is built of-- brick, mortar, wood, stone, wall coverings, etc. But as a concept, "historic fabric" is more than just materials. The historic fabric of the house is its historic "feel." When a shopping center was proposed for a tract of land across from the Manassas National Battlefield, it was said that the visual distraction would destroy the fabric of the site. When a developer began to chop down trees downstream and across the river from Mt. Vernon several years ago, the damage to the scenic easement of the historic mansion and its "fabric," were being destroyed. For our purposes, "historic fabric" refers to both the concept of physical materials and the historic atmosphere the building and its surroundings convey. Historic buildings are like works of art. Again, as Harry Jackson said, you cannot like everyone in the world, and you can't like every work of art in a museum. It is nice that some have dedicated their lives to the protection of these buildings-- just because they are old. After all, who are we to say that any given building, whether attractive to us or not, is not conveying to someone an artistic and cultural message we are just not capable, at this time in our life, of understanding. Once historic buildings are gone, they are gone, never to be experienced again, and no longer available for us to enjoy when we grow intellectually to a point where we can appreciate what they have to offer us. There are many risks facing historic buildings. Rivers and railroads were the highways of yesterday. Many historic buildings, therefore, are found on flood plains and in less than ideal parts of town, threatened by blight, crime and the elements. Many historic buildings are located in either the oldest part of towns or in the wilderness, preserved by the secret of their existence. Many have been used and abused. Now it is up to us to protect them, to work with the restorationist to implement measures that will assure they remain on our Earth for all to see and enjoy for centuries to come. Some buildings are preserved by being totally dismantled and moved to safer ground. Shelburne Museum in Shelburne, Vermont, is a classic example of how nearly forty historic buildings from barns to churches--even a lighthouse and steamship-- have been moved from all over New England to a resting place where they can live on forever. But that type of restoration is not always possible to do. Sometimes we must provide these homes with a defense against the elements and other threats, and we must do so in the least destructive or damaging manner. Major historic or architectural sites like The Hermitage, Andrew Jackson's home in Nashville, or Mt. Vernon, the home of our first President, receive periodic repair and restoration worthy of their status as national monuments. But security practitioners are often called in to provide protection for lesser known structures with less than adequate funding. Often the architect is not a restorationist and preservation is not his first concern. In such cases, the security practitioner must make certain that what the architect does, does not add to the damage that the "restoration" does to the building. Many historic buildings operate as museums. In such cases, the building is often the primary "artifact" in the museum's collection, and the collection often centers around the house itself. In other situations, the house is not a museum and serves the needs of residents who live or work in it on a daily basis. Compromises are often made with kitchens and other facilities upgraded to contemporary standards. In some house museums, even electric power, heat and phone service are not permitted in order to preserve the historic character or fabric. If you can't move an historic building to a safer location, you don't have electric power, phone lines and other critical services-- even water for fire suppression in some cases-- and you are not permitted to drill holes or install equipment that "intrudes" visually on the fabric of the space. How can you protect it? What standard must be met? How much security is enough? The above is an extreme example. But the point is well made. The security practitioner must know the rules of working in an historic building and must abide by those rules. He must, above all else, be creative and adaptive and be able to find-- or even make-- equipment to do the job the way it has to be done. Start with a risk assessment survey. What are the risks that the building faces? Is there a collection that must be protected? Fire is always a primary concern in protecting historic buildings and must be included as one of the potential risks. But the locations of many historic buildings-- on water, for example-- place them at greater risk. The age of the structure often makes them less able to withstand the ravages of nature than their modern counterparts. After identifying the risks, identify the likelihood of any of the risks occurring. Determine the "criticality" of each risk. What will the consequences be if one of the events occurs? If the historic building is a museum, are the artifacts replaceable? Is the building likely to be totally consumed in flames if a fire breaks out? Would a flood destroy the building or just harm the contents? Once you have determined the risks the building will face, ascertain the latitude you have in implementing protective measures: What is your budget? Will the building be under restoration to the extent that you can run alarm wires behind walls or install sprinklers? The first rule in securing an historic building is to do as little damage as possible to the historic fabric. Damage can be physical or aesthetic with security equipment and hardware intruding upon the visual appearance of the space. You must ascertain the extent that this rule is to be applied. Most buildings are damaged to some degree before you begin your work. and electrical service is run. As you can see, the approach to securing historic buildings is initially the same as the approach to securing any other structure. Don't start off planning to compromise on your security or fire protection. Select the optimum and appropriate hardware and equipment and make compromises later. If you are working with an architect or preservationist, consult him regarding the limitations he will place on your efforts. Can you use the existing lock cylinder hole, re-drill a slightly larger hole, or will the only existing hole be patched and concealed. The preservationist may tell you that the door is not part of the original fabric and the lock will not visually intrude on the appearance of the space. On the other hand, he/she may tell you that the door cannot be locked by any means whatsoever! Such decisions must be made for each and every component of your security plan. What you are doing is making an assessment of the effects of every piece of security equipment and every installation technique on the historic fabric of the building. You also will be assessing the relative costs of doing the work since work in historic buildings is often more labor intensive and thus more expensive than in modern building retrofits. Work in historic buildings is not only more difficult than in modern buildings, it is also often more time consuming and time is money. After you have initially decided on the optimum course of action to be taken and rejected compromises, ascertain how realistic it is to do the work the way it should be done. Look carefully at the limitations that historic fabric, cost, and aesthetics will make on your initial plan, and begin to consider the effects any compromise will have on the security you can provide. Be very much aware that there are unwritten rules that must be followed in every phase of security design and planning. Every specialty has its rules. Security specialists securing a church find it difficult to lock the doors, as churches must be open and available as a sanctuary at any hour of the day. Museums hang their assets on the walls rather than lock them in vaults because access to the collection --even 50 million dollar works of art-- is essential. Many commercial establishments require that their security strategy accommodate customers who are "always right" and do not want to feel they are being "watched," "supervised" or otherwise restricted. And so it is with the art of securing historic buildings. Preservationists sometimes go to great extremes to protect every piece of building material from even the slightest damage or intrusion from modern equipment. Don't fight it. Don't try to change it. It's a fact of life we must live with and learn to work around. The American Society for Industrial Security has published "Suggested Guidelines in Museum Security" to guide museum operators in deciding upon a minimum level of acceptable security and fire protection. Through its Museum, Library and Cultural Property Council, it may soon publish a companion document, "Suggested Guidelines for Securing Historic Buildings," which will address compromises that may be made in museums housed in historic buildings or historic buildings operated as museums without collections. The "Guidelines" will likely recommend that alarm systems be hard-wired whenever possible, but will accept wireless alarm systems if properly maintained and supervised and tested with sufficient frequency to assure they operate effectively. The "Guidelines" will require Grade AA line security to UL Standard 1610. But if the historic building is inaccessible to phone lines and cellular service is available, cellular phones can be used to carry the alarm signal to the central station. Other compromises typically required in historic building security will be addressed, but the document will clearly require that compromises not be made purely for economic reasons, unless the cost of providing optimum security is simply formidable. While a cost/risk analysis is often made as part of any protection program analysis, in historic buildings it is often the case that the installation of the protective equipment itself is considered to be part of the risk to the building and is weighed very carefully against the cost of doing the work. Greater expense is usually more tolerable in historic restorations than in retrofits of modern buildings when it reduces the damage to fabric. In protecting the assets of a modern building such as a corporate office building would you ever spend $15,000 for access controls on doors to a room containing only $5,000 in furnishings? Certainly you would-- if the contents were otherwise "important." Intrinsic value is not nearly as significant as other factors. I know of one firm that spent $15,000 for access controls to keep night shift personnel from taking a nap on the Chairman of the Board's office couch. Another spent much more after the brass name plaques were stolen off the backs of each member of the Board of Director's conference room chair. A university spent far more protecting its national championship football trophy. The key to success in securing historic buildings is flexibility. Given the rule that no fabric may be destroyed without careful consideration of what affect this destruction will have on the future of the building, we must often seek alternate means of securing historic sites. In one recent project, the author was told that the ancient doors could not be adequately locked, so provisions were made to leave them unlocked, but to install volumetric motion detectors inside. The building's hand-carved moldings could not be drilled, and the architect wanted the motion detectors installed near the ceiling to minimize their visual impact. So the decision was made to skillfully run wires along the wall surface under the molding rather than drill the molding. John Hunter, Midwest Regional Curator of Security for the National Park Service in Omaha, was responsible for hundreds of historic buildings. He has said that the appearance of the security and fire protection equipment is important to any building, but that in modern structures, the decisions regarding the appearance of various devices, such as smoke detectors, are often made on the basis of the appearance of the devices themselves. That is, is the detector attractive and unobtrusive or ugly and obtrusive? But in historic restorations, additional aesthetic considerations are made, including how the device looks against the historic background. I agree almost entirely with Hunter's premise but I think that the appearance of the security and smoke devices against the background of a museum wall is not unimportant. Motion detector manufacturers often promote their futuristic-looking device as being attractive. Most smoke detector manufacturers try to build detectors that are as small in diameter as possible, yet project farther from the ceiling than larger diameter models. These may be attractive for some settings, but the less that you see of a detector in many applications, the better. Hunter is correct however, that the way modern hardware appears against a building's background is far more important in historic buildings than in modern buildings. Hunter, who sits as a member of the ASIS Sub-Committee, which is writing the security guidelines for historic properties, also reminded me that there is often an added dimension that must be weighed. While some historic buildings do not permit a single modern intrusion-- even electrical outlets and light fixtures-- it is sometimes better to install security and fire devices right out in the open without any attempt to conceal them. Of course, the size and placement of the detection equipment is always important, but less so in such cases. The theory is that if you try to hide a smoke detector in a light can or conceal a wire behind a wall and damage the wall, and if you are not totally effective at concealment of the device or the damage, the component or damage will be highly visible. But if you place the component right out in the open, it may not be noticed as we are so conditioned in our modern lives to seeing such modern visual intrusions. We are 20th century creatures and are conditioned to "tune out" modern items we see every day. This principle is important. There will come a time in the decision-making process when you must decide if you are going to spend thousands of dollars to hide your wires, or run them on the surface at the ceiling where they may blend in with the background. We, as protection specialists, will have to present all points of view to the preservationist, and then live with his decision regarding the amount of visual and real damage we can do to the fabric. A good compromise might be to select the best looking detector for the specific location and surface-mount it on the wall, hidden from view as much as possible. wires in one project, the author felt that the building had been standing for well over 100 years and would stand for several hundred more. Wireless technology is maturing at such a rate that this is likely to be the last hard-wired system the building will ever need. Future systems, will be totally wireless as battery and detector technology improve. In the life of a historic building, ten years of exposed but well hidden wires are quite acceptable. Drill holes in hand-carved moldings are forever. Often it is necessary to compromise standard procedures in order to meet conservation concerns. At The Hermitage in Nashville, Tennessee, the author faced just such a problem. Ceilings were not original in the building and were, in fact, being replaced when the sprinkler system was installed above the ceiling and below the floorboards of the floor above. This meant that wires could be run for the motion detectors through the ceiling and would not have to penetrate moldings. It would have been possible, since moldings were removed and restored, to run alarm wires behind the moldings. The fragile, original wallpaper was at risk. It would have been necessary to drill small holes through it. The problem was resolved when small brackets were manufactured that enabled wall-mounted detectors to be mounted on the ceiling. Wires penetrated the modern ceiling and never touched the moldings or walls. 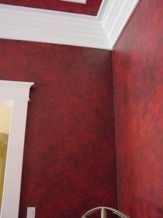 Air space was provided between the back of the bracket and the wall fabric so the wallpaper could "breath." While this made some detectors more visible, it protected the fragile wallpaper and still enabled us to saturate the room with detection. Often the architect or preservationist will allow you to install visible motion or smoke detection if the appearance is minimized. Since many historic house museums have tours which follow a set path, the security system designer must study the tour route and make an effort to mount detectors so that they are behind the tour group as they move through the building. It is often the case that motion detectors are mounted over the entry door in a period room since the visiting public will not be as likely to look up as they will be to look across the room. Thus a detector can be placed right out in view, but not noticed. There are times when you simply will not be permitted to install modern smoke or motion detection in a period room or historic building setting. The rules of the game will be such that you will not be allowed to intrude in any way on the space. Sometimes, microwave detectors can be concealed inside closets, behind walls, or under beds. In one project, the author designed an elaborate system that would be unacceptable for conventional buildings. Motion detectors were concealed in the cavity created by the interior window shutter. The old house involved had shutters on each window, but the shutters were on the inside, not the outside. Opening the shutters allowed the infrared detector to be exposed and protect the room. When the shutters were closed, there were no detectors visible. But this introduced the possibility of human error in that the guard might forget to open the shutters before closing. The detectors then would simply protect only the cavity they were concealed in, since the infrared detectors do not "see" through anything, let alone shutters. To protect against this, we designed microswitches that "set up" only when the shutters were fully closed, i.e., in the night mode. If the guard failed to open the shutters, the nighttime alarms would not "set up," and he could not activate the panel. Sometimes you must resort to portable detection. More than one historic house has nighttime detectors that are stored away in closets by day and set in place by guards before closing each night. Long wires are run each night to receptacles located in closets or otherwise hidden from view. While this also leads to the possibility of human error, it is often the only alternative available. Portable detectors are also being used for daytime protection in historic house museums. Charles Schnabolk, an electrical engineer from New York, responded to a set of bid specifications the author wrote for a device to protect period rooms from anyone who might jump the rope and molest the valuable antiques and artifacts on display. Schnabolk's device is small and unobtrusive and, more importantly, looks like a standard hydrothermograph, a device commonly used in historic building museums to measure humidity. It blends in well with other modern devices that might be necessary. Sitting on the floor just inside the door of a period room protected by a rope barrier, the device can be powered by building power or internal batteries. It recharges at night when plugged in by the guard. When someone reaches into the space, a curtain pattern detector detects the movement, and a digitized human voice plays back one of three pre recorded messages such as, "Please don't reach across the barrier." The message is repeated as often as a violation occurs. But if a visitor actually crosses the barrier, a second detector is activated, a loud horn sounds, and a radio signal is transmitted to the control room. The device, called a Dual Electronic Barrier, eliminates the need for unattractive devices on ceilings or walls or installation damage to fabric. When you cannot provide a specific type of protection for an historic building, you may have to compensate by providing an alternate type of protection. Many historic buildings operated as museums refuse to install security lighting around the building. The world of the 18th and 19th century was a dark one, and people today need to experience the darkness our ancestors lived with every night of their lives, if they are to benefit from the full educational experience of a visit to the site. To compensate, it might be necessary to equip guards with night vision devices, install exterior seismic detection or infrared beams, or patrol the grounds with K-9 patrols. The skillful practitioner who works regularly in historic buildings soon becomes an expert in concealment of protection devices. One historic house has Halon fire suppression tanks under beds and in closets, with discharge heads in fireplaces or penetrating walls through holes concealed in the moldings. Another has sensor mats under carpets to detect the straying of tour group members from the prescribed route. Still another has concealed remote imaging CCTV cameras behind books on a bookshelf. Occasionally it becomes necessary to adapt. On one job where it was not possible to install a modern lock on a very old door, the author designed a custom lock that the building security personnel placed over the door each night to secure it. In another instance, a gate was secured at night by a high quality bicycle lock to avoid damaging the grillwork. Every possible tool must be used in protecting historic houses. Security in some buildings is so well designed and concealed that it has little or no deterrent value. A great deal of the value of CCTV lies in its deterrent effect. Most criminals don't like their pictures taken. Visible alarm devices often convince a burglar "casing the joint" to go elsewhere where the assets are less well protected. But when these devices are so well concealed that this deterrent value is lost, you may have to take steps to subtly make security known to those who are looking for it. Historic buildings located in areas subject to disasters require appropriate planning. If the building houses artifacts, the plan will include provisions for relocating them to safer facilities. Be mindful of the fact that the architect is not trained to recognize potential disasters, and it will be up to you to bring them to his attention and work out solutions under his guidance. Psychological security is a tool that can be an important part of any security arsenal, but one that is especially important at historic buildings where security often is not visible. In one historic farm, visitors reported to a visitor center several miles from the main complex. They parked their cars, assembled for an orientation, and were transported to the main house via shuttle vans. Upon arrival, they were assigned to a tour guide and taken on a tour. At no time was security apparent to the untrained eye. The complex was well protected by armed state police officers, who occupied an office in the main complex as well as at the visitor center. It was decided that the thief would probably case the building by taking a public tour. The historic site's management did not want to display its security measures to the public, but agreed that it should be visible to the burglar who might be looking for it. To draw subtle attention to the security measures taken, the author recommended "psychological security." Visitors arriving from the parking lot at the visitor center-- a modern structure not subject to the rules that security be totally hidden-- were greeted by a CCTV camera at the ticket booth. Also, a sign, which read, "For directions and road conditions, please contact any State Police Officer or call extension 355 on our courtesy phone to reach the police headquarters located in the main house," was conspicuously placed. This clearly advertised the fact that police, not guards, were present at the visitor center and at a larger office at the protected site. When visitors traveled to the tour site on the shuttle, the shuttle driver offered an orientation. Part of his message was worded in such a manner as to make the visitor aware that security measures were in effect during the entire visit. As soon as the visitor stepped off of the shuttle van, a tour guide assembled the group and did a very obvious head count. After the first stop on the tour and before entering the building, the guide performed another head count, signaling that anyone who left the group would be immediately detected. was regarded as critical to the psychological impact we sought. The guide assembled the group in the first period room, and as soon as all visitors were attentive, she was instructed to step off the aisle way into the room and appear to accidentally set off an alarm. The room was protected by an infrared detector with a curtain detection pattern and a locally annunciated audible alarm. As soon as the guide activated the alarm, an attendant in the hallway entered the room and said, "Is everything OK?" The guide replied, "Yes, I'm sorry. I accidentally stepped too far into the room. The alarm system caught me." The above scenario was well rehearsed by every guide and was designed to show off the effectiveness of the hidden alarms-- which could not be installed in every room. But who would know? Another historic site, concerned about nighttime intrusion, wanted to convey a similar message-- that there were consequences for trespassing after hours. At the visitor center parking lot, a small sign was visible for all to see. It said simply, "We are sorry that we can't accommodate your pets on the tour of the mansion, but our Ranger's patrol dogs wouldn't approve!" The security practitioner working in the historic building environment must know as much about the tools available as possible. He must be able to adapt those tools to fit his needs. To be fully effective, he must have an appreciation for the need to protect historic fabric and must be as protective of the fabric as the preservationist. A sound, working knowledge of construction techniques used in historic structures and of conservation requirements is essential. The security practitioner must be able to achieve a proper balance of protection by employing a correct mix of equipment, manpower and psychological deterrents. To achieve a successful mix, he/she must be able to properly assess risk. He must relate the building structure to its infrastructure, that is, he must know how the building actually works and what must occur there and be able to incorporate security provisions that allows the building to function but still be protected. When all is said and done, the security professional working in an historic building will do twice the work. He will be frustrated by not being able to eliminate all of the risks. But he will know that he has played an important role in preserving a small piece of American history for all future generations to enjoy and learn from. With so much of America's moral fiber, work and social ethics, and strength of commitment being lost to drugs, crime, and the "modern way of life," it is satisfying to be able to say that you have played a role in protecting the last remaining vestiges of our past. Hopefully that knowledge of the past will inspire us to our former greatness. The author is a Principal of Architect’s Security Group, formerly Steve Keller & Associates, Inc. Protected by Copyright All Rights Are Reserved.